Definition: A Market Intelligence system focuses on the systematic collection and processing of information from all the relevant sources to ascertain the changing trends in the marketing environment. In simple words, the marketer gathers data from all the available sources and process these into meaningful information that can be used to make critical business decisions. In order to obtain the market intelligence the marketer uses several sources such as newspapers, magazines, books, trade publications, social media, and feedback from customers, suppliers, distributors who cover the entire gamut of an external environment. The more information about the market environment is gathered the more accurate business decision will be and will enhance the efficiency of business operations. Training and Motivation Programs for Sales Force: Several training modules are conducted to encourage sales force who are in direct touch with ultimate customers to collect all the relevant information related to the product along with the customer’s experience of using it. 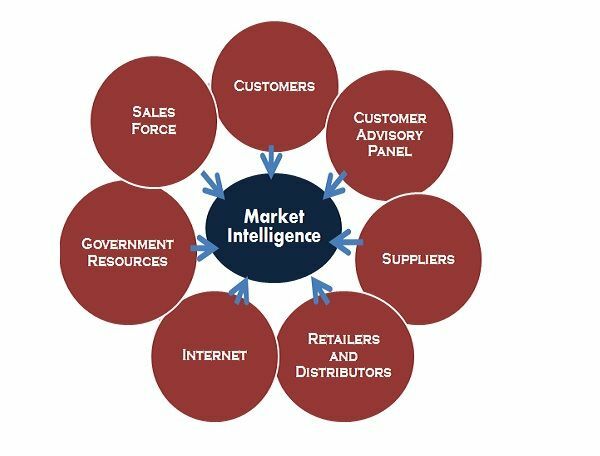 A market intelligence is acquired when the sales force is motivated to give the valuable feedback and suggestions about the product offers and the opportunities prevailing in the market to their managers, who then convert these into the actionable plan. Encouraging Distributors and Retailers to seek Market Intelligence: Companies hire some specialist who visits several stores and showrooms to check the customer experience with the product or service. Also, retailer or a service provider send its own person as a “mystery guest” who acts as a customer himself and check the quality of a product and the way employees are handling the customer’s queries. Keeping a check on the Competitors: In order to sustain in the market, the companies should have complete knowledge about the doings of its competitors. One of the major market intelligence tools is the internet where every information about the competitor’s product and its variants, the price and easy pay schemes, services, and its feedback is available, and the same can be used to have a comparative study. Also, the information about the competitor’s activity can be acquired through the distributors, retailers and other intermediaries who are sitting in the market and know the whereabouts of each player. Customer Suggestion Panel: Companies using their internal market intelligence prepare a list of their customers who frequently make the purchases and among those set up a panel who give their expert advice to new customers about the product and its benefits.This method is very useful as people rely heavily on others experiences and a try a product or a service at least once. It is most commonly seen in schools & colleges where the community of alumni is created who give their expert comments on the quality of teaching and the courses to be opted in a particular educational institute. Government Data Resources: Government Resources are also the means to gain market intelligence. The population census is considered crucial through which population density, trends, demographic characteristics, etc. is determined, and the same can be used to make judicious market plans. Also, the data about the literacy level, agricultural production, inflation and recession, are provided by the government that acts as an important tool for information. Thus, government data resources are useful to gather relevant information about the prevailing market trends. Information from Outside Suppliers: The companies can also purchase the information from other companies who are specialists in doing the researches and prepare the reports about the other market players. Acting as an important aide to market intelligence, these research companies can provide detailed information about the competitor’s product and service that can act as an important tool in designing the market plans. Customer Feedback System: The most common and easy way to gain market intelligence is through the use of customer feedback system. Generally, it is online, where the customer is required to give his valuable feedback or suggestion on company’s website about the product or service consumed by him. Also, the feedback can be taken in person by asking the customers to fill up a form after they have availed the services. This is a more reliable form of information since it is directly provided by the customer himself. Once the data is collected from all the possible sources, it is sorted into a meaningful information which is then used by the management to design the marketing strategies. Thank you for your business perspective.